ong back there was a prince who was known to be a connoisseur of all things fine in life. One day, during his royal travels in the land of Bengal, he met a princess renowned for her ethereal beauty and impeccable taste in clothes. Awestruck with her charm the prince vowed to give up everything to marry her. The prince was no other than the famous Mughal Emperor Jahangir while the princess was Mehr-un-Nissa who was later named as Nur Jahan owing to the aura she shone with when wearing the brilliantly woven Jamdani, which happened to be her favourite attire. The story of Jamdani however dates back much before Jahan and Mehr-un-Nissa - The timeline for jamdani can be traced as early as c. 321 -185 BCE. Megasthenes, Greek ambassador in Chandragupta Maurya's court writes vaguely - "Their robes are worked in gold, and ornamented with various stones, and they wear also flowered garments of the finest muslin." The finest muslin as Megasthenes calls it refers to one of the most time and labor-intensive forms of handloom weaving, renowned throughout the world as Jamdani. Originally extracted from Karpas cotton and currently worked on cotton-silk blend, Jamdani weaving is like tapestry work where small shuttles of colored, gold or silver threads are passed through the weft. An eco friendly art, Jamdani is spun by hand and foot tools and may take up to 13 months to complete, if two full time weavers work on it. The vibrancy of colours and the richness of motifs help identify a Jamdani from the variety of other handloom produce. Though the origin of the art remains rooted in Bengal, the name is shrouded in mystery. Some believe it to have originated from Persian language, where Jama relates to cloth and dana means dots. Hence, it refers to a type of dotted cloth which was popularized in the Indian sub-continent by the Muslims. Another version has it that the word comes from the Persian words Jam and Dani which mean a superior variety of liquor and the vessel, respectively. It is said that the female bartenders used to wear a kind of muslin that gave way to this name. The journey of Jamdani began in the middle era. It was a combination of Parsi and Mughal cultures that bore its fruit in Dhaka and the consequence was to the development ofa special form of jamdani known as Dhakai Jamdani the use of Jamdani was restricted only to the royals and the landed class Though the Jamdani business was monopolized by the Muslims in the early days, it was traded by the Europeans, Iranis, Armenians, Mughals, Pathans and the Baniks later on. It was the most exported item from Bengal in the 17th and 18th century. One of the traditional weaving forms of Bengal, the art of jamdani making steeply declined with the fall of the Mughal Empire . Slowly the market lost enthusiastic craftsmen because of the imbalance in production cost and entailing wages. While the international market sold it at steep prices the craftsmen earned not enough to sustain themselves. To bridge the gap, Biswa Bangla has steppedforth to uphold and revive the tradition of Jamdani, by providing the community of artisans a lucrative overseas market; a market that will not only sustain their livelihood but promote the art internationally. The aim is not only to restore and revive the near extinct art form but also to ensure that the artisans are empowered and have the means to earn a decent livelihood. A poet wanders off to a remote village and meets an old widow; her skin hanging loosely on a bony frame, eyes pale, mouth dry and wrinkled. She sits solitary in the uthon (courtyard) with an enormous rug spread beside her. The poet intrigued, sits down and takes a look at the rug. Mysteries unfold. The rug or the kantha isn’t simply a quilt, it is much like a diary containing scenes and snippets of the old woman’s life – all weaved and stitched, as if one someone has neatly and meticulously drawn her life on a white canvas. This famous tale by Abadindranath Tagore talks of an 87 year old woman from Srihatta, Bangladesh, who seemed to have recorded her life story, a period starting from her marriage to old age, in the elaborate Kantha that she had crafted for years. But she is not the only one with a marvelous tale; she is a part of a sorority which has played big role in making kantha an indigenous cottage textile industry of Bengal. Within the context of Indian embroidery, the kantha is a living tradition. Kantha making in Bengal is a ‘Women’s art’, that has flourished under the creative nuances of rural women of the state. Like cavemen’s depiction of their lives through painting, kantha is also related to story-telling – kanthas in Bengal tell the stories in the daily lives of women of Bengal, each kantha being a chronicle of an individual’s life story. Not surprisingly thus expressions are often personal and at times whimsical lending the art form a great diversity in terms of patterns, intricacy and structure. Take for example the legendary Nakshi Kanthas which is one of the best examples of embroidery from kantha league, done with 50 different stitches. The chief idea is to recycle old and worn out cloth by sewing them meticulously and embellishing them with saree borders, motifs, ritualistic symbols or imaginative scenes. Similarly there is ‘Bostani’ which is the small size and square format kantha used as an all-purpose wrapper and which unlike Nakshi Kanthas uses only three kinds of stitches pattern-darning stitch, satin-stitch and button-hole stitch. It does not boast of intricate detailing but is simpler in design and stitching pattern – what is common however is the aspect of storytelling. The boundary of the kantha’s shape is perhaps the only constraint to the embroiderer, all else is left free to her imagination – to use language and imagery from the storehouse of memory. The kantha stitcher’s own dreams are patterned in the form of the diverse images that adorn the kantha. Kantha quilting is first a domestic, utilitarian art intended for personal use. Whether as an ornate wedding quilt or a simple cover for daily use, the kantha remains one of the most illustrative quilts in India. Kantha takes a number of forms: as quilted bed covers; pillow covers, seats for guests, prayer mats or as padding in bride’s palanquin. The motive of kantha making traditionally was thrift and economy combined with aesthetics, the idea being to utilise old and worn out cloth by sewing them together meticulously with close stitches and embroidering them so that not a single piece of fabric was wasted. Today, owing to rapid urbanization and lack of recognition this art of kantha making is a dying art. Under the aegis of Biswa Bangla however this near lost art form is being given a platform to be showcased so that the artisans finally get the recognition that they deserve. Various near extinct techniques of kantha making are being researched and restored – new techniques to use the kantha in an innovative fashion are being explored. Under the aegis of Biswa Bangla the untold stories of the kantha craft are finally getting to be heard. Muslin, one of the costliest fabrics in the world, was developed over a challenge - a challenge between a king and a poor artisan. Several hundred of years ago, a poor old man decided to visit the king with a goal to procure work at his court. Stopped at the gate by the guards, the poor man came up with a sudden trick. He told the guards, that he had something immensely valuable to show the king. Intrigued, the guards took him to the darbar or king’s court. Unfortunately he had not with him anything that was either expensive or of value. As a punishment the king ordered his men to banish the artisan. Understanding that he was in grave trouble, the poor fellow promised to return to the king’s court after 30 days with an expensive gift, a gift that he challenged the king has possibly never seen. For 30 days nothing was heard from him. On the 30th day, a haggard old man entered the court. It was the same old artisan who had promised to bring his king an expensive gift. He brought out from his bag a glittering cloth, so soft, light and smooth that it could be pulled easily through the loop of a finger ring. This was indeed a cloth that the king had never seen or heard of in his life. Thus was born the Muslin, an object of desire and a symbol of luxury for Kings and Nawabs of ancient India. There are many such stories that surround the actual origin of Muslin which remains to be a much debatable topic for historians. Some historians believe that muslin of the finest weave was found from the excavated sites as the Indus Valley Civilization some 5000 years ago. However, the most acceptable one is that along the reach delta line of river Brahmaputra, grew some fine quality cotton plant. Craftsmen spun delicate yarns from these plants which they called muslin. There are also some controversies on the origin of the word Muslin. Some say it was derived from Mosul, an old trade centre in Iraq, while others think that muslin was connected with Musulipattam, sometime headquarters of European trading companies in southern India. Because muslin is not a Persian word, nor Sanskrit, nor Bengali, it is very likely that the name was given by the Europeans to cotton cloth imported by them from Mosul, and when they saw the fine cotton goods of Dhaka, they gave the same name to those fabrics. History records proofs of Bengal’s muslins being exported to far off Rome under the name ‘textalis-ventalis’ – ‘woven air’ and other fancy names like ‘evening dew’ and ‘morning mist’. The best quality muslins had such fineness that it was a very highly valued item which only the very rich could afford. Involving highly intricate processes of spinning, weaving, darning and washing, the celebrated muslins of Bengal attained the status of an art. A standard piece of fine Bengal muslin measured 60 feet by 3 feet. The textile was so fine that a small hollow bamboo tube could contain a whole piece of the finest muslin. Unable to compete with machine-made products and because of lack of support to weavers and insufficient market promotion, the muslin industry hit rock bottom sometime in the 19th century. However, this ancient and near extinct trade has now been revived under the aegis of Biswa Bangla which is committed to promote it worldwide again. Project Muslin is a revival package for this uberfine cotton-thread by the Department of Micro, Small and Medium Enterprises and Textiles, Government of West Bengal. Its primary objective is to revive the muslin industry and ensure that the artisans get proper returns and appreciation for their unique skills. West Bengal produces nearly 55% of the muslin made in India. But out of the thousands of muslin weavers that were engaged in this craft, just 780 remain. Project Muslin aims to revive and promote Bengal muslin through a holistic approach like skill development, technology support, design inputs, product diversification, credit linkage, marketing support and encouraging the rural young to take up the craft. Indo-Portuguese quilts and shawls hail from a period in history when textile industry of India reached its peak of sophistication. The era coincides with invasions from European colonists, the Mughals' demand for luxury items and a host of new artistic influences. Patronised under great kings like Akbar, Jahangir and Shah Jahan, the Indo-Portuguese quilts were produced for a select, upper-class clientele in India and abroad although most of them were traded to Europe. Later on tussar came to the forefront and became personal favorite to the then Nawabs and their Biwis (wives). Amongst this group the best-known quilts are the monochrome, tussar silk embroidered coverlets made in Satgaon and Hooghly Bengal; specifically called ‘‘Bengalla quilts” and “Satgaon quilts”. The tussar silk embroidered quilt represents one of the most important schools of Indian embroidery, which flourished before the arrival of the Portuguese. Under the patronage of the latter the designs showed strong impressions from Christian biblical sources and Italian Renaissance. With India’s cottage industry taking a dip in the international market, Indo Portuguese shawl weaving has also witnessed a great set back. The art has suffered mainly because of craftsmen choosing to opt for different livelihoods than investing time in this exhaustive art. To boost the revival of India’s dying traditional art forms, Biswa Bangla has come forward with potential marketing ideas to evoke the lost golden era; this apart, it also aims to showcase India’s innumerable talents to the world. Finery and complexity are always intertwined as they set the standards for a high life. Take the faintly fragrant Balaposh for example; whether these silk quilts got the word posh into it for the same reason is for the user to decide. Actually, it's quite hard to differ after you have used one; you won't have too many options. 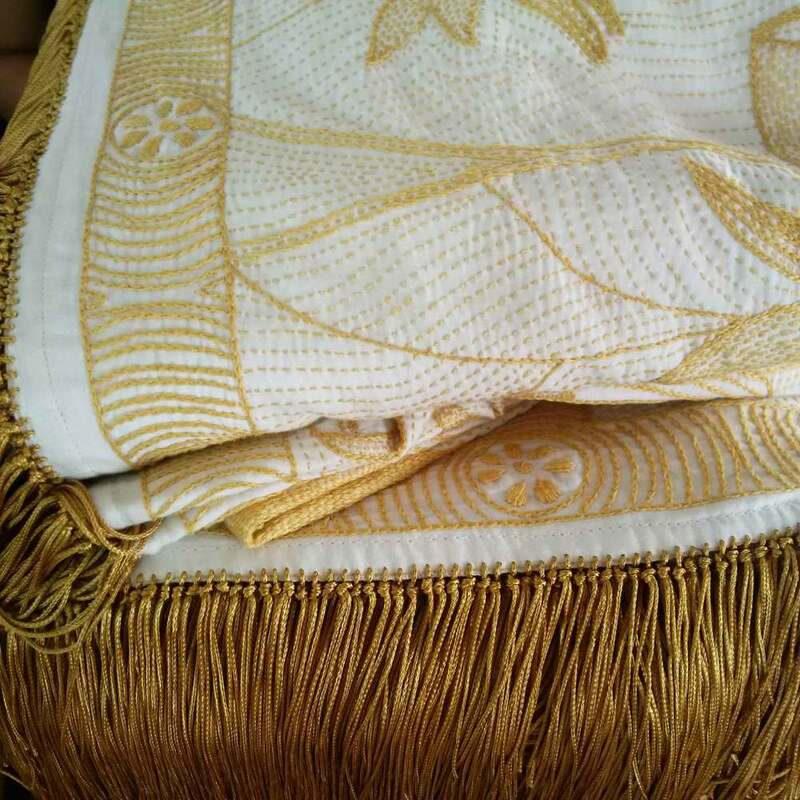 A surprising thing about the balaposh is its usage as an elegant shawl. This proves furthermore the fine craftsmanship that originated and still exists in Bengal, Murshidabad district. A sweet-scented warmth its characteristic, the balaposh is a spread of layered, attar-scented cotton wool between two layers of silk stitched at the edges. The Nawabs of Bengal are to be given credits for the advent of the Balaposh in the 18th century. Nawab Sujauddin's sense of perfectionism (then ruler of Bengal, Bihar and Orissa) and his demand for an extravagant quilt is said to be what brought the balaposh into existence. He wanted something that's soft as wool, warm as the lap and gentle like a flower" to wrap himself in. Needless saying, this tall order was way beyond the reach of the then craftsmen of the region, except for one Atir Khan who took a vow to create that exclusive piece. Following the King’s specifications, the balaposh was quilted to perfection. Thus it was born and in its initial years, they only served the Royals. Today as well, the art remains a well-hidden one - a closely guarded legacy carried forward by Sekhawat Hussain Khan, Atir Khan's great-grandson, the only true karigar (craftsman) existing in this near-extinct trade. His production technique is vastly different from the commercialised variety. How the three layers (a thin sheet of attar-scented cotton snuggled between silk two blankets of silk) should be laid is still a mystery to the rest of the world but to one person. Quilts come and go, but the balaposh is forever! Born in adroit and artful hands, the unsurpassable aesthetics of these lightweight, hand-crafted, exquisite creations never cease to intrigue. It's the quality that distinguishes the balaposh from other quilts and that's more than the stitches along the edges. The real secret is how not to let the middle layer of cotton wool lump up into a ball; so when you are looking at one, remember that just ornamental borders and contrasting colours are not the only defining criteria. They are not least responsible for the characteristic softness and its sublime fragrance wafting through the layers; a true balaposh must seep its sense of posh-ness into the senses of the one who uses it. The art is, however, in a deplorable state as of now; close to dying and it's the deliberate conservatism of the artisans to blame. All these years, the art of making balaposh has been passed on as a family heirloom; the only way to save the art is passing it on to the future generations. It's the only way to save the legacy from going extinct and the craft from fading into obscurity. That's exactly what Biswa Bangla is up to; it has taken the initiative to train artisans on this art form, spearheading to protect the ancient techniques and production methodologies. Alongside, Biswa Bangla also aims at empowering and improving the livelihood of traditional craftsmen who, once trained in this art form, will be able to not only carry forward the legacy but shall also learn to sustain themselves on its basis and earn a decent livelihood.